To fight your enemy, you have to know your enemy. In the case of TB this means analyzing the data which is collected by National TB Programs (NTPs) to look at trends, numbers and age- or gender-specific rates, and conducting TB prevalence surveys and drug resistance surveys. You also need to find the best ways to combat that enemy, and test your weapons through operational or implementation research. 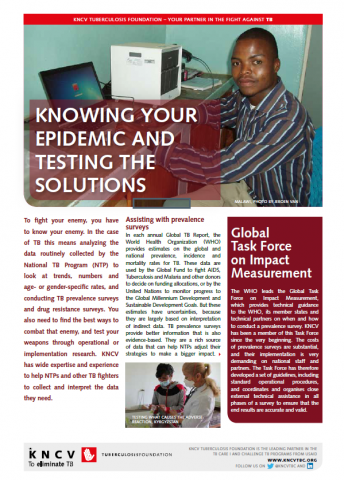 KNCV uses its wide expertise and experience to help NTPs and other TB fighters to collect and interpret the data they need.